The Flow Cytometry and Cell Sorting research group has acquired a great expertise in pre-clinical and biomedical research. In particular, the group is experienced (as certified by several publications on international scientific journals) in flow cytometry combined with molecular and cell biology techniques, applied in research projects principally concerning vascular disorders, stem cells and onco-haematology. The Flow Cytometry and Cell Sorting service is equipped with the most advanced technology that allows many different research applications. In particular among the instruments, as detailed in the equipment section, the BD FACSAria II cell sorter is especially powerful and versatile and it can be found in very few centers in Italy. Applications for basic/preclinical research, especially for in vitro evaluation of the effects of drugs, cytokines or compounds of different kinds on cells of various origins. Studies specifically designed for the clinical research. Development/improvement of industrial products that will use flow cytometry techniques. Design of innovative cell therapy protocols in preclinical models. The service permits to: 1) obtain highly purified cell populations from various human and animal tissues by high throughput cell sorting; 2) phenotypically characterize isolated populations and/or any cell type circulating in human or laboratory animal peripheral blood; 3) monitor cell proliferation, survival and differentiation following in vitro and/or in vivo drug treatments. 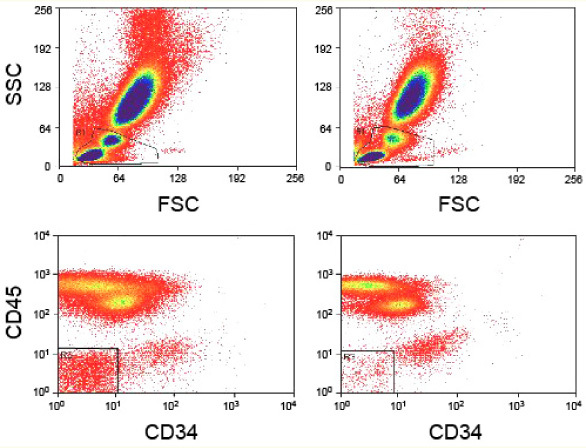 The Flow Cytometry and Cell Sorting service works in collaboration with the Biobank and Microscope services in characterizing cells of interest. Studies of ploidy levels using propidium iodide staining and evaluation of cell cycle phases with monoparametric analysis. 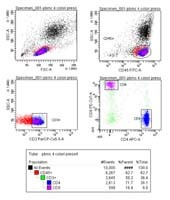 Cell proliferation: quantitative evaluation of the different cell cycle phases (G0/G1, S, G2/M) by BrdU incorporation and detection by double labelling with anti-BrdU antibody/PI. Quantitative evaluation of cell apoptosis using AnnexinV/PI or 7AAD. Monitoring transfection efficiency by green fluorescent protein (GFP) detection, and possibility of sorting GFP-positive cells. Monitoring of cell differentiation through the analysis of lineage-specific surface markers. Characterization of cell subpopulations circulating in human or laboratory animal peripheral blood: identification of lymphocyte, monocyte and granulocyte subpopulations by physical parameters (forward scatter and side scatter) and their immunophenotypic characterization through mono- or multiparametric analysis. Phenotypic characterization of specific cell populations, through multiparametric analysis, with the possibility of using up to 9 different fluorochromes, and subsequent physical separation of cells of interest in viable conditions. 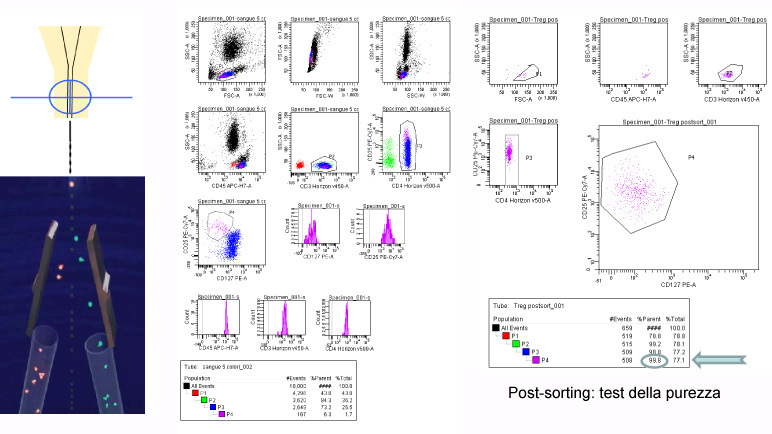 Isolation of highly purified viable cell populations (identified by specific surface markers) from different human and animal tissues, using high throughput cell sorting. These applications concern both the in vitro evaluation of the effects produced by drugs, cytokines or other compounds and also the research aimed at broadening the clinical understanding of various diseases.